I thought the rear wing was supposed to go up again, just as this was found to be necessary a decade ago. It says Concept 2 in the picture so I wonder how many other concepts there are and how they differ. Love the design but can someone explain why an unbranded colour scheme wasn't used by Ross Brawn? Looks like a promotion for Ferrari! Easier to compare to today's cars when using a current team livery for a guess. Gives a better impression of how it would actually look. This is one slide from a presentation that was probably more than a minute or two. 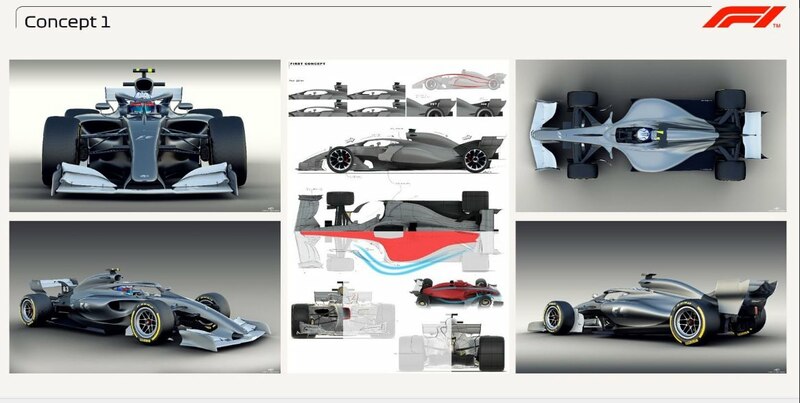 For all we know there were several concepts shown from several constructors each in their own liveries. Whoever did the leaking probably just that that the Ferrari concept would ‘sell’ the best as a news piece. In general I like it and there are some good ideas there. It’s good that a lot of the fiddely bits aren’t there, but if the floor is still flat they’ll find a way back and DRS won’t go away. I like the front wing arrangement. Especially the sleek nose section. But the only problem i see for me is the front wing has 2 elements. Vettel confirmed for Ferrari seat in 2021! It certainly would be a much needed improvement aesthetically. I don't see the floors getting any smaller and that one has a very reduced floor area. If F1 is going to more ground effects like the F2 cars they will need plenty of floor area. To me it just looks like one of this year's cars reflected off the back of a spoon. Concept single seaters always looked like they've melted. Quite like it though, but then I like melted ice-cream too. Maybe there's a subliminal link there. The tires look pretty cool. 18 inches can be done and not be ugly. A lot of the changes will contain air from being directed sideways and should allow trailing cars to get closer. This is designed to bring back closer competition. But this is just one of many intended changes. make the cars more raceable and improve overtaking. there will be more standard parts. cheaper and less sophisticated engines, better sound, more power,and reducing the necessity of grid penalties. Laudable goals. The only one I would question is the standard parts. Is it really necessary with the budget cap? With a budget cap I'd rather have the design regs opened up a bit. I think that way you'd get a greater variant of car performance race to race. I think they're looking to standardise the parts that don't offer much performance differential; the steering rack + column is an example I've heard cited. 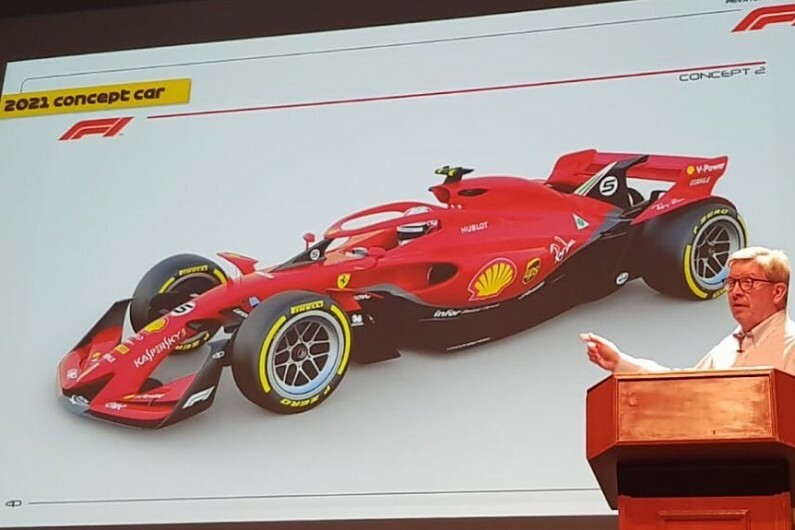 Which to me makes sense, you have the teams all designing and building certain parts of the car at great expense and all converging on the same solution. That makes sense, there must be loads of things they could standardise that don't affect performance. How do you square greater variety of car performance from race to race with making the driver a more important element? Once again this goes back to the 'enthusiasts' belief that F1 is a manufacturers championship, while everyone else believes and is sold to on the basis that this is a driver's championship. Liberty probably need to decide which it is, and I think if they do they'll see the money is on the drivers. It's all well and good doing wind tunnel testing on these designs but surely the only way they are going to tell if it works is for the FIA to pay one of the teams to build two identical cars and get a couple of recently retired F1 drivers to drive them at a selection of circuits as some circuits are easier to pass on than others and see how much easier it is to overtake. Ooof, those concepts look really racey. I agree, the proof will be in the pudding, we've had regulation changes before that have promised more overtaking and here we are, again. If they don't like it they can go elsewhere as far as I am concerned, they always manage to find something to moan about. They look very much as though closed cockpit was in mind, not a giant leap of imagination to go in that direction. Kind of OK-ish. The biggest change is in the wings, specially front ones. But since there are three concepts, who can tell are they realistically going to resemble the cars once when they appear in 2021. Bigger change was between the car of the seventies and the car of the eighties. More features and general appearance was changed back then, between 2018 and these concepts. I don't find these concepts so much different from what we have now, except for the wings. They look pretty cool. Would look even better with an enclosed cockpit instead of the halo, at least to my mind, but they look sleek and fast, and that's always good. The most important thing, of course, will be how well they perform, and we won't know that for a while (assuming this even ends up being the direction that is taken in the end). I notice that in the shinier, more developed two-car image it looks like there are some partial covers on the rear wheels, but I don't see those on the other designs. I wonder if that's actually a thing they're considering, of if it just somehow made it onto that one image anyhow. 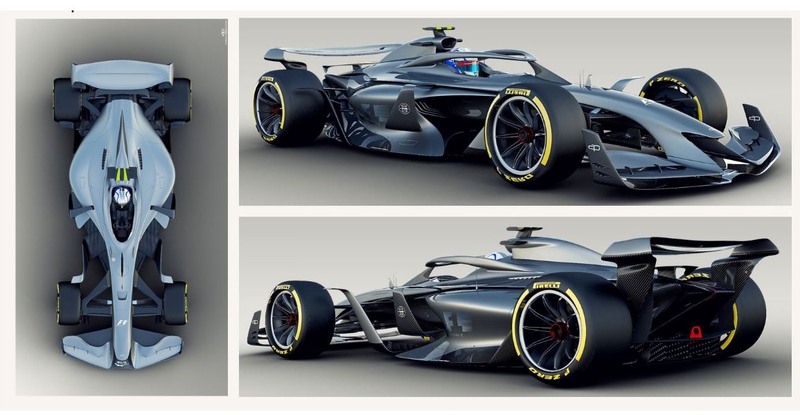 Quick question: if these are Liberty concepts, for real, why does the silver car have the Bernie-era F1 logo on the sidepod? Well spotted! I hadn't even noticed! It's on the nose cone as well. I would speculate that whatever external company did the renderings made an error and Liberty published the images without noticing. I am a fan of motor racing. I don't have any strong connection to any team or driver. What I want to see is that at the beginning of the race weekend, to see six or more drivers who have a realistic chance of winning, and close battling for the entire race. I understand that some fans cheer for just one driver, and their idea of a "good weekend" is to see their driver dominate. But there are many parts that can be standardized, and we would not know the difference. The more astute can spot the difference between the Ferrari and Mercedes rear wing, but for many, can you tell the difference? Does it matter to a fan watching on TV? I have always advocated that the FIA supply the front and rear wings, as well as the undertray. That would be a massive reduction in costs because each team spend small fortunes in those parts. The top of the car can be unique to each manufacturer. The sport needs to grow, it has to attract young fans. It also has to be less costly, and have better racing, as in closer and more intense battling. More or equivalent power, and drastically less downforce created by the wings on top of the car. However they get there, I don't really care. That needs to be achieved, and it shouldn't be difficult. Cars look cool. I don't dislike the larger wheels based on these photos. The halo looks substantially better to me on these cars too, not that it matters really, what they look like. We'd all like beautiful cars, sure, but if they can race each other closely, and follow each other, in addition to having huge power that is up to the driver to control, I'd be a very happy guy. I don't think it's likely possible to go back to the days where cars were sideways through corners, but I'd sure love it if the power/downforce ratio was significantly modified so that the cars would be really, really unsettled if you are on the throttle too much. I have to admit, I've changed a lot in my old age. I used to love the theory of being able to drive upside down because of huge downforce, but that no longer appeals to me. Huge downforce cars as we same them in their current iteration is so damaging to the racing. I want huge power, and nervous cars. If they need to produce downforce at high levels, they need to do from the underside of the car. I agree, as a Lewis Hamilton fan I enjoyed the 2010 - 2012 seasons much more than 2014 - 2016. I want to see a competitive sport first and foremost, and watching your favourite team or driver beat the others on roughly equal terms is much more satisfying than watching them cruise away at the front with an unfair advantage. I still think that key aero parts like the wings and floor should still be designed by the teams though. Innovation and engineering are in F1's DNA and these components are key performance differentiators where these traits come to the fore, so even if they offer little visual distinction they make a real difference to the spectacle on track. Sadly at the moment, innovation and engineering take a back seat to basic spending power; equalise the team budgets and I think you get the closer, more intense battling that the sport needs. 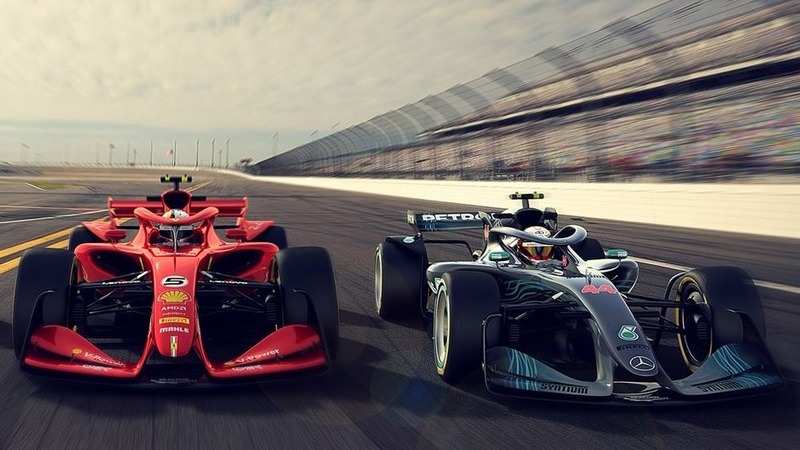 Even today you can see this; the teams on similar budgets do have some great races together, and it would be even better if the cars were designed in such a way that they could follow each other.